Disclosure: I was asked by the game's sponsor to help improve the game's English translation. I have not been paid for it in any way, nor did I change anything about the story or the text's structure. Azure Games' action adventure Somnium: Exodus is a horror game. Or maybe it's a science fiction story. Existential crisis? All three? Man, this is where the written medium really lets me down. Pretend I'm sauntering from streetlight to streetlight down a menacing dark street, looking mysterious and thoughtful with a bubble pipe as I speak, okay? 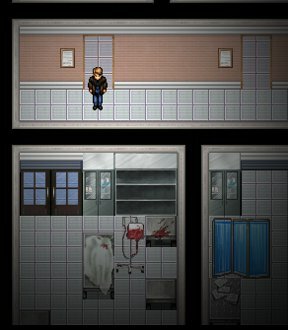 As the game opens, you awaken, disoriented and in pain, in an abandoned hospital unable to remember your own name or why you're there. Strange things, dangerous things, seem to flit in and out of reality as you explore the city and empty streets, trying to find out what's going on... but the truth is stranger than fiction, and our world will never be the same once you discover it. Quick! Now find and play the spooky mystery sound effect from Earthbound! Doo-doo-doo-DOO-doo! For the most part, Somnium: Exodus is a very straight-forward play. You move with [WASD] and the [arrow] keys, and interact with the [spacebar]. Clicking the star in the upper-right corner will open your skill tree, which you can put points in as you level up, both to grow stronger and activate/deactivate passive abilities such as being able to spot crucial items or skipping puzzles every ten minutes. 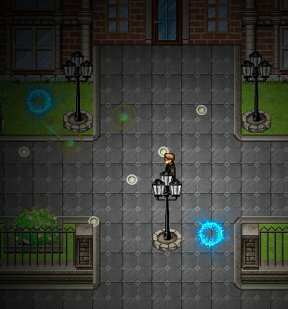 Enemies, when you encounter them, will most often spawn periodically from the glowing blue circles, and attack by emitting bursts of orbs you'll want to dodge, and avoid touching the enemies themselves to boot. To fight back, you'll need to click them multiple times to destroy them. Your health is represented by a green bar, and your mental fortitude by a blue one, which depletes whenever you attack an enemy, and slowly regenerates over time. Health regenerates as well, though significantly more slowly, so be careful with baddies, since once you die, it's game over. The game autosaves for you each time you solve a puzzle or otherwise make story progress, but the only way you can manually save is by interacting with coffee machines. Analysis: Somnium: Exodus is an extremely ambitious game. It's not really scary so much as it is intriguing despite its excellent ominous atmosphere. The plot takes a lot of twists and turns in ways that can be hard to follow, which can make you wish the game kept all the text you found on hand for you to refer to whenever you wish, but darned if it isn't clever in a way that makes you want to keep following the trail of clues. It's sort of a shame that the profanity is so heavy and unnecessary at times, since players who don't care for it will be missing out on a clever science-fiction storyline, albeit one that ends on a big cliffhanger right as things start picking up. I want to call it Sliders meets a certain classic RPG I can't name because it would basically spoil everything. Somnium as a series has big plans for itself, and stands to be even bigger, badder, and more epic in the future considering the ways its storyline could lend itself to taking you some truly fascinating places... it just might be a ride that's less smooth than others. The problem lies in the fact that the gameplay feels a little rough around the edges. The clicky combat is clunky, and since there's no way to destroy the enemy spawners, you're stuck dealing with swarms of foes all the time, many who can easily kill you in two hits early in the game. Health regenerates painfully slowly, and combined with the fact that most enemies are the same throughout the game, it sort of winds up feeling as if Somnium: Exodus would have been stronger without them at all. Some puzzles can also feel a little obstinate, with clues that are potentially too obscure or rely on scouring places that don't stand out to see if something has been hidden there. There are no optimisation options, which means some players might find it too laggy, while others will simply find themselves dealing with bugs. It's the sort of thing that will only improve with time as its talented development team becomes more experienced, but at the moment turns the experience rockier than it should be. It makes for the sort of game that could have been absolutely fantastic, instead of just good, if it had had a lot more player feedback early on to smooth out the rougher edges along the way. As a result, Somnium: Exodus is a game that needs patience on your part, and perhaps polishing from the team down the line when it comes to future installments. It's a fairly massive game for a browser adventure, and gorgeously rendered to boot with its detailed areas and artwork, to say nothing of its soundtrack. Stripped of its action sequences, brave though it was to include them, and packed with more puzzles, Somnium: Exodus might have been on much firmer footing, but as it stands, it's still an extremely creative game that stands as a clear labour of love from its team, who is one we hope we see a lot more of. Somnium: Exodus Walkthrough now available! You'll start the game in Marylen Moneroy's hospital room. Exit through the door at the bottom of the room. After you take a few steps, your character will stop moving for a moment and declare he needs some medicine. Fortunately, there's some nearby! Go to the next room on your left (Curt Cobein's room). Examine the red medkit on top of the table in this room to find the painkillers. Exit Curt Cobein's room and walk right until you see the sign for Jorn Lemmon's room. Walk straight down through the large open door to enter the lobby area. Approach the two closed doors at the bottom of the room and press [spacebar] to try to open them. The doors are locked with a passcode, so let's find it and come back later. While you're still in the lobby, walk to the table in front of the bottom sofa and examine the magazines. Note the information in the article on "that popular old horror game" (Silent Hill for the curious). The article describes a man searching through a foggy town filled with monsters for his daughter Cheryl. Got that? Okay, let's continue! Exit the lobby and walk to the next room on your left, which is a lab room full of "sophisticated equipment." Inspect the pile of papers on the floor to the left of the computer desk to collect NOTE 1. This first note says: "He tries to find..." The message is incomplete; looks like we'll have to find a second note to make sense of this riddle. Exit the lab room and walk all the way to the right until you reach a reception desk in the hallway. From here, walk through the upper hallway on the right to the open door that leads to the large patient ward area. Once you enter the patient ward, take a look at the pile of papers on the floor beside Seed Wishes' bed (it's the middle bed in this room). You'll find NOTE 2 here. This note says: "...but only the fog and horror surrounds." This must be the the second half of note one! And the message should sound pretty familiar... but we'll get to that later! Leave the patient ward through the door you came in and walk back to the reception desk in the hallway. Now head down into the lower hallway and enter the first door on your left to find the staff room. Go to the flashing computer screen and press [spacebar] to interact with it. You'll need a password to unlock the computer. The icon above the password box is a picture of an infamous character known as Pyramid Head. Whether or not you recognize him, you've already got the clues you need to log in. Take another look at NOTE 1 and NOTE 2. They describe a man trying to find something, surrounded in horror and fog. This is the same story you read about in the magazine at the reception area. What was the man trying to find? The article said he was looking for his daughter Cheryl. Enter CHERYL into the computer to log in. Examine the pile of papers on the floor by the lower computer desk. This mysterious message contains a clue to opening the closet in this room: "Find a patient. He is not like the others." Search for the patient signs in the hospital and read their files. All of them are named after celebrities with dark or violent causes of death such as murder, suicide, and overdose with the exception of one patient. Take a look at the sign on the blue privacy screen by the far right bed in the patient ward. Unlike the other patients, Steve Works is the only one diagnosed with a disease (cancer). Go back to the staff room and take a look at the closet between the two steel bookshelves. The password is Steve's last name: WORKS. After you open the closet, the DOOR CODE will be added to your inventory. Exit the staff room and return to the lobby area. Re-examine the locked doors at the bottom of the room. Enter the numbers in the DOOR CODE: 4108. After you open the doors you will be automatically transported to the next area, your home. Read the letter on top of the coffee table. Your character may have amnesia, but at least we know his name now! The letter's addressed to "Cameron" at the top of the page. After you read the note, a series of blue portals will appear around your apartment. Enemies will sporadically spawn out of these portals, so be careful! Dodge the orbs it shoots from its sides and don't let it touch you to avoid taking damage. Find a safe place to stand and click the enemy until it explodes. Each click attack costs CP which only regenerates will standing still or by using the Sacrifice ability which loses 10 HP in exchange for 10 CP. Quickly move to the left side of the apartment and examine the lower left bookcase. You can a book to select it, click the left or right arrows to move the book along the shelf, then click the book again to set it in place. So it's safe to assume these books need to be organized in a certain order. Take a look at the titles of the books, specifically the capital letters. From left to right, the first letters of the books' titles (except for The Europeans, ignore "The" because it's just an article) are: R, E, A, O, N, C, and M. Seem familiar? It's an acronym of the main character's name: CAMERON. Arrange the books from left to right to spell out Cameron's name to solve the puzzle. Once you solve the puzzle, you'll hear a clicking sound "from the other side of the house." Move right to the bedroom, being careful to either avoid or kill the enemies that will respawn at the blue portals. Examine the open cupboard between the broken television and the computer to find your diary. The room will shake after you close the last page, and your character will state that he should go to the laboratory next. Walk back to the middle of the living room, then go out the door at the back to leave the apartment. While you're out here, use the coffee machine to save your game. Go down the stairs to head outside. Move all the way down and to the right to find your car in the parking lot. Try to open the front left car door to find out it's locked and the keys are missing. Go back into the building, up the stairs, and re-enter the apartment through the door at the bottom of the scene. Search the apartment for the key's hiding place. Walk left from the entrance of the apartment to the fireplace by the bookshelves. Pick up the CAR KEY that's poking out of the left side of the tiger skin rug, near the tiger's head. Try to open the front left door to the car. Your character will tell you that the car's out of gas. Search the trunk at the back of the car to find a JERRY CAN. Interact with the lower right side of the car to pour the gas from the can into the fuel tank. Open the front left car door again to get back in the car and make it to the Laboratory parking lot. Walk up and to the right (past the blue door) and then open the wooden double doors to enter the Lab. Go up to the hallway past the reception area. Turn and walk right until you go past an office room and reach a row of vending machines. Use the coffee machine here to save your game. Enter the closest door to your left that leads to a small room behind a closed glass door. Interact with the small blue screen between the glass door and the window to open the door. Continue forward into the room full of scientific equipment. Examine the large monitor on the wall at the upper right corner of the room to view the Somnium Interfact. You'll notice that three components are inactive on the list: Component 3, Component 13, and Component 14. Note that Cameron mentions Component 14 is produced at the center and that he should look for it in the hospital. He also mentions searching the computers in this building for more information. Walk back down to the coffee machines in the hallway, then continue right and go through the upper open door at the end of the hall. Inspect the computer on the lower left desk to find the instruction manual Cameron mentioned earlier. Now you'll be able to collect the three components, starting with Component 13 in this building. Cameron also says that the last component, Component 3, should be found in the basement. Go back out to the hall, then through the open door to the lab room at the bottom of the screen. Pick up the dark object on the table at the lower left side of the room, found between the two groups of beakers, to collect COMPONENT 13. One down, two to go! Walk all the way left towards the reception desk of the lab building. Go through the upper left doorway to the room full of scientific equipment. Head up to the attached room, being careful to avoid the enemies that are likely moving around the top of the glass tubes, and then use the ladder to climb down to the lower level. Go through the open door into the small room above the entrance. Examine the large green monitor on the wall at the top right corner of the room. Click the two green buttons on the screen to turn off the power supply in the basement and to turn on the elevator. The button next to "Power Supply Basement" should now say "ACTIVATE" (indicating that the power there is currently off) and the other beside "Central Elevator" should say "DEACTIVATE" (indicating that the power there is currently on). Use the ladder to go back upstairs. Go back to the coffee machine and save your game, then head straight down into the elevator. Push the button beside the elevator door to go down into the basement. After you exit the elevator, head straight up the hallway and turn right to reach a room full of pipes. Navigate through the pipes to the other side of the room where you'll find the power supply equipment and a few barrels. Since you turned off the power supply earlier, it's now safe to examine the wires on the floor. Cameron will fix the wires and put the grate back over to cover them. Gi back through the pipes to the hallway and walk down. When you reach the open doorway, turn left. You'll find a semi-hidden hallway that leads to a glass door. Be careful of a concealed enemy that can patrol this hall! Activate the console beside the glass door to open it, then go through the door to find yourself back at the power supply room. Now that the door is open, you can use this convenient shortcut to move around the basement without using the elevator. Interact with the large green monitor and click the "ACTIVATE" button next to "Power Supply Basement" to turn the power back on in the basement. Walk back to the room full of pipes and navigate to the small room at the bottom right corner where you fixed the wires earlier. Use the pump mechanism at the right side of the room to begin a puzzle mini-game. Organize the hexagons at the top of the screen so that all three red hexagons are on the left side, all three green hexagons are on the right side, and the blue hexagon is in the center. Move the blue hexagon two spaces to the right. Move two spaces left again. At this point, the blue hexagon should now be at the farthest left space. Move two spaces right again. Move two spaces right one more time. Now the blue hexagon should be at the farthest right space. Move one space left to complete the puzzle. After you complete the puzzle, the repaired pump system will drain all of the water out of the basement tunnels. Walk back to the hallway and enter the office room opposite the elevator. Examine the computer on the desk at the corner of the room to read the emails from Nicholas. Exit the room and walk all the way right and then through the open doorway to enter the break room area. You can use the coffee vending machine here to save your progress. Inspect the paper on the table to find April's clue. At the bottom of the note you'll see five symbols, a star inside a rectangle that is composed of 16 line segments. Each symbol is missing some of the segments. If you fill in the missing lines, you'll find they make the shape of a letter of the alphabet. The five letters found in the five symbols are: P U S S Y (stay classy, developer). Go back to the main hallway, then go through the first door on your left and up the hall to the locked glass door. Activate the console beside the glass door then enter the 5-letter password from April's note to open the lock. Search the open safe between the lockers and the desk to find COMPONENT 3. Return to the hallway. Walk left and up towards the doorway that leads to the room full of pipes. Enter the door on the left and go down the stairs to reach the Basement. Go down the stairs and walk left until you reach an open doorway above you. Walk up to the coffee vending machine and use it to save your game. Go back down to the corridor and walk all the way right. Enter the doorway above you, then continue to walk all the way right pass the pipes and to the next doorway. Walk up to the next room, through the archway, and across the bridge that goes over the water. Move left, following alongside the outer wall, until you reach the second doorway (you'll pass an open doorway and another bridge, but you can ignore them both). Walk up through the door and continue left to the top left corner wall. Walk down and turn left, then immediately go up through the doorway into the small room. You should see G-9 written on the back wall of this room. Go up the ladder to enter the warehouse. Examine the computer on top of the upper left boxes to read Richard's notes. Move to the bottom right corner of the room and pick up the KEY (that was mentioned in the notes) on top of the bed. Climb back down the ladder to return to the basement sewers. Retrace your steps and return to the entrance stairway. Go up the stairs and walk to the elevator to go back to the lab. Go left to the reception area and walk down to exit the lab building. Quickly walk down to your car before enemies spawn and travel to the Hospital. Walk down and left from the parking lot to reach the hospital gates, then continue up to the front door and enter the hospital. Go out the door of the reception area and walk up the end of the hallway to the left. Unlock the double doors with the KEY from the G-9 room in the Basement. Walk all the way to the end of the corridor to find a lab room. If you inspect the middle sarcophagus in the back area, Cameron will mention that he thinks the component might be inside, but to open it you'll need to run the machine first. Go back into the main room and examine the middle computer console to begin another minigame. To solve this puzzle you must select the correct sequence on the grid by following the navigational clues. The points on the grid have a number (ranging from 1-3) and a letter (N, S, E, and W). The letter refers to the cardinal directions north (up), south (down), east (right), and west (left) while the numbers indicate the amount of spaces to the next correct point on the grid. Every time you select the correct grid point, one of the lights at the top right corner of the puzzle will change from red to green. If you choose a point incorrectly, the puzzle and lights will reset. Start at 1E. Move one space to the right. Click 2E. Move two spaces to the right. Click 3S. Move three spaces down. Click 2W. Move two spaces left. Click 1E to complete the puzzle. After the puzzle is completed, return to the back area of the room and search the middle sarcophagus to find COMPONENT 14. Exit the Hospital and return to your car in the parking lot. Travel back to the Laboratory. Walk up to the wooden double doors to enter the Laboratory building. Go through the upper door to leave the reception room and move to the second open doorway on the right to reach the Somnium room. 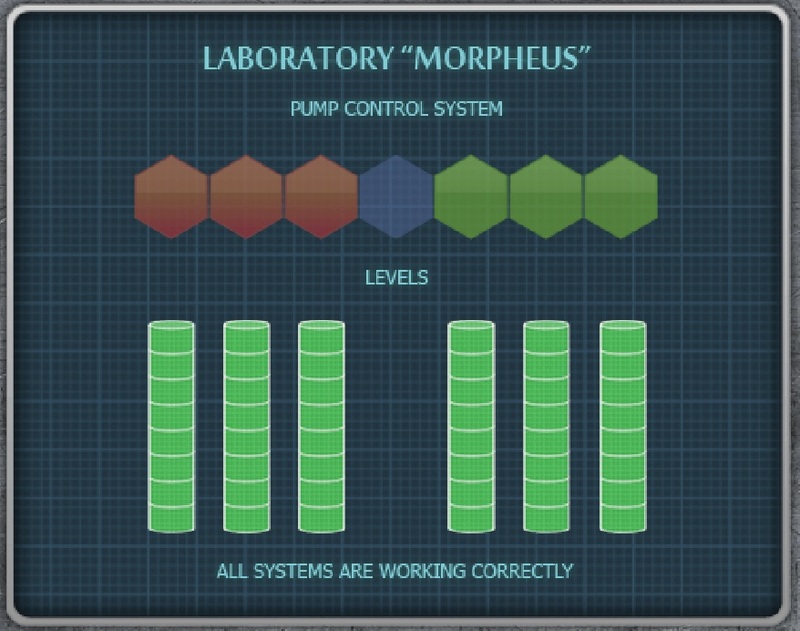 Examine the monitor at the top right corner of the room to place the three COMPONENTS from your inventory. Interact with the left side of the bed at the center of the room to travel to Somnium. Walk up through the two open doorways and into the hallway. Continue left until you find Cameron. After you've finished speaking to him, walk down to the lower room and use the Somnium machine. Uhm... am completely stumped by the order of the books. Have tried alphabetical, alpha by author, date of publication, color of book and color of foggy-bit near the top (near as I can manage given partial color blindness). Any help would be most welcome. Heres a hint for the books! I am astonished that people can put so much work into a game but not let players separately control music and FX, thereby forcing us to choose between droning repetitive music and complete silence. Thereby *ruining* it for people like me who cannot handle the music but dislike playing in complete silence, especially when there are available FX I should be able to hear because I should be able to shut off the music. I just don't understand. Very many people must be like me in this regard. And it must be so easy to give us separate control. So -- what's the issue? Is it vanity? Or power-craziness? ("I want to control the player's experience as much as possible") Or inability to imagine that people wouldn't want to have the music on? Whatever it is, I don't really care, but just stop, please stop. We decided to sponsor the game because exactly as you said the developers have put an incredible work into a game. But as Dora said too, the game still needs improvements so we and developers count on feedbacks for improving it and your comment will be something to consider and I think it should be easy to add it. The life of this game is really long with 32 locations to explore. Well I was quite enjoying this, though there were a couple of blips but now, not sure is this is a bug or if I am missing something. I selected to go to the Laboratory from the hospital but I am now stuck on this screen with a couple of enemy shooters and traffic lights. It says the car has run out of gas and I can't see a way to proceed from there. I cant exit the screen in any direction and there is nothing to interact with except the car. Clicking on the social media sites from the options menu gives you credit but does not take you to the sites. The overuse of the f word adds nothing to the game at all, and just makes the dialogue jar for me. A bit like a little kid who has just learned his first "rude" word and has to keep saying it. Not sure if I can/should do this but link to screenshot of stuck area. POP ! got it ! Great game, too bad it's a bit buggy. I got killed and restarted from my last savepoint, but somehow my character gets stuck (I can move one-two steps but after that the game seems to be forever paused). I already tried refreshing the page and all to no avail. Will probably play it again in a week or so, provided the bug is fixed. @Diana are you sure the game is not paused. Somehow it is possible to get saved in a paused state. It will show you by the gear icon in the top right corner, also there you can pause/play. I can't seem to find the car key.. I can't even get out of the damn hospital I woke up in. Shouldn't the difficulty ramp be a BIT easier at the start? Knowing how much of the password for the door I've found might be helpful. The interface is pretty sucky there. Try clicking on your avatar if you are stuck for what you are looking for. He normally has something helpful to add. Quick note: the developers of the game follow the discussion and already work on some fixes/improvements. Pump Control System which I presume drains the sewer. I don't get the logic of the puzzle! Sorry Jbeaver, I zerged it, just kept clicking, would love to understand it too. The game was really lagging for me so thought that if I cleared data and re-started later it might flow better. Tried menu prompt three times but was unable to clear data. 3 passcodes for me to find (one for the computer, one for the closet, one for the entrance door), and I don't have a single clue where to search for them. I've searched the entire building several times. Is there some obvious clue I've been missing? here's a useful tip, in the cabin (the 2nd location) DO NOT click the bit of paper in the bedroom. it effectively hangs the game and browser window. So have finished the game, but feel like there are still things to do. I haven't found the password for the computer. I haven't found all of the chess pieces, though I have found all of the newspaper clippings. I haven't found a way in to the Astra Castra Numen Lumen. I haven't found a use for the sample quality report. Haven't found a way into the safe. Haven't found a use for the various temples lying around. I still only have two active skills, though there is room for five. My "click on self" hint still talks about getting into G9, but I've been there, completely mapping the sewers, and have done everything I can find to do there. I found a bug on first play through; in the hospital after figuring out the locker/computer code, I typed the code in the computer and it showed me the note with code but didn't register it in the quest log and therefore would not let me access the code keypad to leave the hospital trapping me there. I restarted and continued from the save but the problem persisted, I tried the clear data menu prompt to start a new game but it didn't clear data and left the continue option in place. So I deleted cookies manually and started a new game, the problem did not reoccur on second play through. 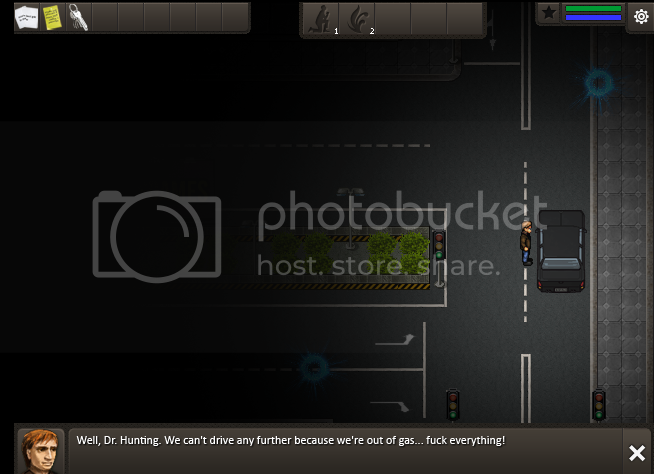 On second play through I did get a random bug when examined a trash can outside the hospital (near entrance), when I examined it it froze the game/browser and eventually had to force the browser to shutdown (latest firefox). Restarted and was able to play the remainder of the game without any bugs. works as a code anywhere? I found the same things but was able to figure out most of them. I wasn't able to find all of the chess pieces or newspaper clippings. If you find everything is there any reward or way to read the newspaper? The numbers you get when you read the books in the temple rooms are the code for the Astra Castra Numen Lumen door. @azuregames you massive troll, it took me forever to find that code... also code can be cracked manually as each correct digit entered shows a dash on the upper left hand side of the screen. Password for computer in hospital is the same as the one that opens the locker (also opens locker). The flash drive is located in the laboratory, check every computer in the research unit, one will give you the flash drive. The safe in the house is opened by solving the clock puzzle (big clock in the room you first arrive in the house). I couldn't figure out the puzzle solution so I used the skip puzzle function/ability. Active Skills: if you click on the star beside your health it brings up a skills menu (skill points are gained as you level). 4 abilities can be gained by clicking on the in game links (2 of them active), and the other active abilities can be gained by maxing out each skill column and making the appropriate choice (for the last ability in each column you can choose between an active or passive ability). I feel that the sewer section is too long given the character speed and the lack of reward for exploration (a few chess pieces/newspaper collectibles really isn't enough motivation to spend a minute walking along basically the same corridor/texture); I feel you either need to shorten/straighten the path or increase the reward for exploration with additional lore, experience or abilities. Right now it feels more like a tool to lengthen the game time experience, without providing additional content (basically grinding). The other possibility would be to vary up the graphics a bit instead of recycling the same textures to make it feel like your really exploring and not just walking down the same pathway. In tight sections I found enemy's spawning on you resulting in instant death to be a problem (especially with the infrequent saves). I would suggest lessening the damage dealt by touching an enemy to be closer to the damage taken from enemy projectiles. In the final area I wanted to explore before talking to the guy, as a result I click on the Somnium before talking to him and getting the explanation/story and went straight to the to be continued screen without warning or knowing the story. I restarted from my last save and got the proper ending. To prevent other players from missing this conversation (probably the most important in the game story-wise) I would set the last conversation to trigger when the player walks by that area/character instead of having to be initiated or prevent the Somnium from triggering until the player has that conversation. Overall I actually enjoyed the game very much and am intrigued by the story. It just needs to be polished/stabilized a bit more and could use a bit of work in regards to pacing (especially the sewer section). I like the combat system (probably really good with a touch screen interface) and find the story compelling enough to look forward to a sequel. It could benefit from some additional active abilities, and less of a reliance on collectables for content (I'm not convinced on the newspaper hunt idea, I feel it broke up the game play in a bad way). Overall though I can definitely see a lot of potential. Oh man, I just realized what the Skip Puzzle button is! It's the Captain Picard Facepalm! Exactly! Imagine our team doing like that, when you skip each puzzle. Thanks a lot for your feedback. We have taken note of your comments. Thanks to Goodkattz for the detailed feedback. It will help for sure. where might you find spare fuel ? @Caspane one thing that did work for me twice when I got stuck so I could not move, was to reload but then after I was still stuck to return to the home screen via the gear icon menu, then continue again. For some reason this sounds odd but it did worked for me and i was able to move again. Even with all the bugs this got a 5/5 from me. The storyline really did keep me hooked and made me forgive the bit of bugginess. Yes, when you get all of the newspaper clippings you can read the newspaper (from the achievements screen I think... upper-left). It was disappointing though. It's mostly the text from the flash drive. I don't have all of the chess pieces so I don't know if you can do anything with that. Thanks you for the computer code! I never would have figured that one out. Thanks as well for the help on Astra Castra Numen Lumen. Bit of a let-down, but still kind of funny. Sewer wasn't so bad... remember, you can adjust your skill points to make you move faster. Just follow the left-hand rule and you'll traverse the whole place in no time. So the only major thing I have left is the combination to the safe in my office, and I have no idea on that (and given how slowly the tumbler moves, I am disinclined to experiment). Also, I have the "Unknown achievement." What was it for? figured that the very special, not-like-the-others patient would have been Steve Jobs, who died of cancer (instead of suicide/murder/etc). I didn't find anything interesting around his compartment. I searched all the stuff of the other patients, with zero results. Thank you all so much for your feedback. They are very important for us. We are working on update right now. Hope, that most of bugs will be fixed. You got "Unknown achievement" after solving Astra Castra Numen Lumen. As for collecting chess, it's just for achievement. You lost nothing except "Сheckmate"
Thanks, everyone! Got the safe, and so the only things left are things I don't care about. Overall impression? This was fantastic in concept and largely in execution. The gradual growing understanding of what was going on was well done, and the story was fantastic. A debugging pass needs to be made by someone through the whole game who is assuming that the player DOESN'T READ ANYTHING. It is really easy to accidentally dismiss a text box if you are moving quickly. If there is no way to go back to that information, then you lose it. The coffee machine save mechanism was lost on me for quite a while. Eventually I saw the comment between screens about it, and was cursing the developers for not putting that info in a tutorial bit or on the help screen. Movement hangs occasionally. I discovered that this can be FIXED by selecting the drop-down menu, quit to main menu, no. The system becomes paused, and then when you unpause it everything is fine. The skill progression was useful but boring. It would have been nicer if skills changed qualitatively rather than just becoming more effective. Enemies aren't varried enough. As it was, there was only a brief period in the middle of the game when I was actually worried about the enemies. Once I pumped up Virile mind I could one-shot them. Alternately pumping up durability/HP made it so I could just ignore them. It is very easy to go nonlinear as a player. First time through I couldn't get the book order puzzle, so I ended up exploring all of the other places and even solving lots of puzzles elsewhere without ever having gotten the diary. Result? The "click on yourself" hints ended up not being consistent or useful. Need to check the internal variables tracking things. For example, I have killed 302 enemies, and presumably each enemy has at least 1 HP, and yet I don't have the KKnD achievement (cause 250 damage). Side-quests should have some in-game impact. Collecting the newspaper clippings? Maybe should unlock a new skill or provide new info. Beat high score on one of the arcade games? Same thing. It certainly should be POSSIBLE to win the game without doing the side quests, but there should be some reward other than just having completed the side quest. Something in between just being stuck on a puzzle and having it solved for you would be nice. Other than the actual bugs, none of those quibbles make the game unplayable, but they would be nice to fix. Thanks kdausman and others for your fantastic feedbacks. I'm happy many of you enjoyed/are enjoying to play the game. I cannot seem to figure out the pump puzzle. Anyone got any hints? The blue is an open space. Shapes can either move into the open space directly next to it or it can 'jump over' one shape into to open space. Component 13 but haven't found out any way to get into the hospital lab nor have I located the entrance for the sewers. I've checked the manholes but they don't open, except for the one right outside my house, but that's just for a temple/book number. Is something supposed to happen when I enter the password on the computer in the hospital? I know I have the right one from reading others' comments, but when I enter the password it just says "accepted" and doesn't do anything else - the screen doesn't change, nothing. Is it a bug, or is nothing supposed to happen there, and the computer is a red herring or something? -they can't reproduce the bug of the pause so they made some changes hoping it could help on this matter too. Unfortunately, I'm not sure you can keep your old data while a new version has been uploaded. I'm genuinely surprised this isn't it's own downloadable game. I've seen much worse, shorter games make it out of 'browser land'. This gave me a sort of Ib vibe at times. "I want to call it Sliders meets a certain classic RPG I can't name because it would basically spoil everything". I have a feeling I know which RPG you mean. This game seems extremely buggy, I've tried twice now. First time I open the locker in the hospital and nothing happens and can't interact with it, second time I get the code but can't open the main door. Is it really worth playing if its unplayable? Can`t find components 3 and 14. Can´t find the key for the hospital, where probably is component 14. Can't figure out April`s code(based on *), which let me enter the lab room with the safe. Any help? Game crashes in Chrome Windows and Linux as soon one Quest Item is picked up. Firefox works though (I like to zoom the screen a bit if that may be an issue). Other than that, the "enemy" and fighting part is in my opinion just stupid. It does not add anything to the game and is nothing but an annoyance. And I'm not even that adventure player guy that hates arcades fully, but I hate trying to solve puzzles while being killed out of random and have to redo stuff. Its just so senseless. If you want to make some fighting (which I would discourage from an adventure game, since many adventurers don't like this at all) than make it occassionally and as scenes itself. Also decide if you want to make it a keyboard game or mouse and keyboard etc. don't switch around. The cabinet in hospital, why doesn't it accept keyboard input? Somewhere in Act 3 and just too frustrated due to the enemies thing all over the place to continue the game for a good while. I don't know, you put so much effort in doing a good adventure game with story and all and then ruin it with something like these enemies, thats whats sad in my opinion. PS: I'm no expert at this, but some sentences don't sound like correct english. The image is fine now. It was an error in the walkthrough's code. I'm obsessed. It's the perfect game for your mind, always having levels you like and maybe some you don't. But all games train your brain in different, fun and sometimes challenging ways. I love it and is definitely one of my favourite. If you like using your brain you'll love this unblocked games 24.